There’s nothing more American than a good old-fashioned ice cream parlor. 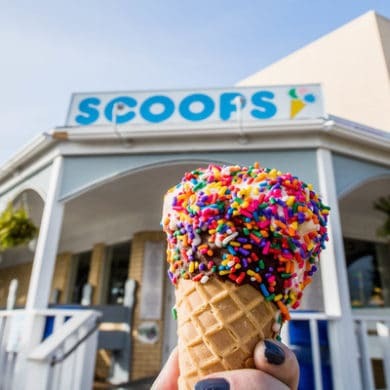 Since 1980, Scoops has been serving up the frozen stuff to visitors and locals in Gulf Shores, AL. To go along with the American classic is a bit of the American dream. Kimberly Hatfield, General Manager of Scoops, told us about her father’s story. Scoops is serving up a wide variety of ice cream creations and flavors. According to Kimberly, there are a couple of clear favorites. Scoops has plenty of seating wrapping around the building, so make sure you bring the whole family! Kimberly spoke to us about the relationships Scoops has built over the years with both local and visiting families. The Hatfield family is also involved in the community that has given them so much. Cool off with a treat from Scoops. Scoops is located at 601 Gulf Shores Parkway Gulf Shores, AL. For more information, visit the Scoops website or call (251) 948-4800.